Explore the very nature of reality and human experience through the Buddha’s quintessential teachings on the four applications of mindfulness. In this course we investigate the nature of human identity and the possibility of freedom through the Buddha’s foundational instructions on the cultivation of vipashyana, or insight. Alan Wallace presents the four close applications of mindfulness — mindfulness on the body, feelings, the mind, and phenomena — through rich pith instruction on selections from the Pali canon, Mahayana sutras, and commentary from the Vajrayana and Dzogchen traditions. Alan’s unique presentation offers an integrative vision of the Buddhist path, and clarifies fundamental Buddhist truths such the nature of nirvana, the unique vision of the path of the arhat, as well as that of the bodhisattva. We learn that these paths share a common ultimate vision: the primordial and unborn nature of liberation. Alan offers step-by-step guidance through the four applications with clear instruction on the relationship between shamatha (calm-abiding) practice and vipashyana, making these timeless teachings applicable to daily life in the modern world. In this first lesson, Alan Wallace introduces the significance of the four applications of mindfulness, across Buddhist traditions. We learn the depth behind core terminology, such as what is meant by samadhi, introspection, insight, and even the term ‘mindfulness’ itself. Alan provides direct and practical background that orients the journey of the course, introducing the texts, traditions, and foundational practices to develop a calm and stable mind, ready for the cultivation of vipashyana, or insight. In this lesson, we learn how Buddhism understands the nature of suffering, as well as the nature of liberation. Alan Wallace insightfully shows us the relationship between both what veils the nature of mind, and what sets it free. Through clear teachings on the first noble truth, the three marks of existence, the five obscurations, and the five jhana factors, we develop a firm foundation in the practical philosophy of Buddhism, to enliven our practice of shamatha on the mindfulness of breathing, and vipashyana. In this lesson Alan Wallace introduces us to core teachings relating to the theory and practice of the application of mindfulness to the body, and the application of mindfulness to feelings. With commentary on the Pali canon and several important Mahayana sutras from “Chapter Thirteen: The Four Close Applications of Mindfulness,” of Shantideva’s Siksasmuccaya, or A Compendium of Practices, we discover how essential these teachings are across Buddhist traditions. Alan guides us in deepening our practice of shamatha, with commentary and insights from the Dzogchen tradition, and presents initial teachings on the practice of vipashyana, or insight. In this lesson, we explore the path of the arhat, the bodhisattva, and how teachings on the four applications of mindfulness highlight a continuum of traditions. Alan presents in depth instruction on how the Theravada and Mahayana traditions understand liberation, and the nature of suffering; both theoretical and experientially. Alan also continues his insightful commentary on Chapter Thirteen of Shantideva’s Siksasmuccaya, or A Compendium of Practices, focusing on the close application of mindfulness to feelings. In this lesson, Alan Wallace offers commentary that takes us to the summit of shamatha practice, defining terms essential to the Theravada tradition, and the Dzogchen tradition of Tibetan Buddhism. We learn that the achievement of of shamatha is an important stepping stone for the practice and fulfillment of vipashyana. Through study and practice on the application of mindfulness to the mind we enter into the world of vipashyana, learn precisely what Buddhism means by mental afflictions, and precisely how these afflictions obstruct us from liberation. This lesson also includes an insightful discussion between Buddhist philosophy and contemporary science with respect to the Buddhist notions of karma and interdependent origination. In this lesson Alan Wallace guides us through the close application of mindfulness to the mind, offering commentary and practice instruction on discerning the essential nature of mind, the sign of the mind, it’s luminosity and cognizance. Through shamatha practice on the space of the mind, we learn to see and discern the factors of origination behind mental phenomena. Alan also presents insights from modern physics to illuminate the plasticity of the mind, as well as space, energy, and time. In this lesson Alan Wallace takes us through the accomplishment of shamatha, and into the territory of the unconditioned mind, the realization of emptiness. Offering commentary from the Theravada, Mahayana, and Dzogchen perspectives, we learn how the nature of mind is understood and described across Buddhist traditions. In particular, Alan offers insightful commentary on both the Theravada understanding of nirvana and the Dzogchen tradition’s discussion of pristine awareness. We also learn two essential perspectives on the path of realizing emptiness; the view presented by Padmasambhava, and the view presented by Tsongkhapa. In this lesson Alan Wallace outlines the essential aspects of the Buddhist Path, and the how the four applications of mindfulness seamlessly weave into the unfolding of an authentic path. Alan also shares with us insightful commentary on a potential bridge between the first and second turnings of the wheel of Dharma. Practice in this lesson takes us from the the heart of shamatha practice, the awareness of awareness, into vipashyana on the nature of objective appearances. In this lesson Alan Wallace clearly outlines the stages of dependent arising, according to Buddhist thought, in order to reveal how the subtle and conscious mind comes into being. Alan then relates discussion on the arising of the mind and phenomena to discoveries from contemporary science, and the insights of quantum mechanics. In this lesson, Alan Wallace takes us to the summit of the path, according to the Dzogchen tradition of Tibetan Buddhism. From this view, we learn about the fusion of shamatha and vipashyana, how mental afflictions arise, and are ultimately empty of any inherent nature. Alan also introduces the practice of nonmeditation, based on the visionary writing of Düdjom Lingpa in Buddhahood Without Meditation. Dynamic lecturer, progressive scholar, and one of the most prolific writers and translators of Tibetan Buddhism in the West, B. Alan Wallace, PhD, continually seeks innovative ways to integrate Buddhist contemplative practices with Western science to advance the study of the mind. Dr. Wallace, a scholar and practitioner of Buddhism since 1970, has taught Buddhist theory and meditation worldwide since 1976. Having devoted 14 years to training as a Tibetan Buddhist monk, ordained by H. H. the Dalai Lama, he went on to earn an undergraduate degree in physics and the philosophy of science at Amherst College and a doctorate in religious studies at Stanford. He later studied Dzogchen with Gyatrul Rinpoche, a senior teacher in the Nyingma school of Tibetan Buddhism. 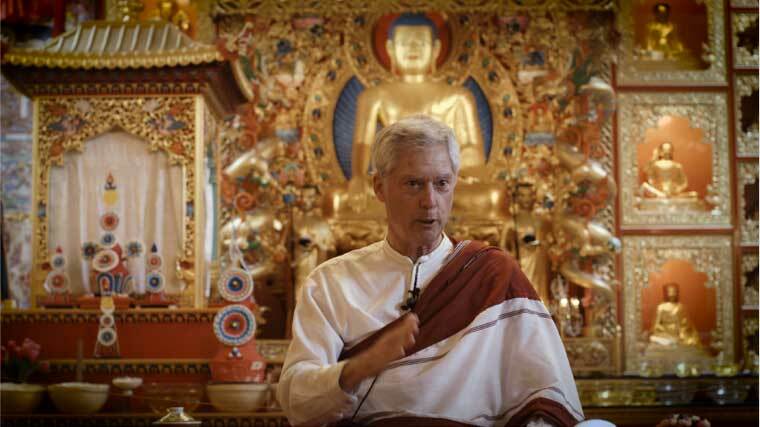 With his unique background, Dr. Wallace brings deep experience and applied skills to the challenge of integrating traditional Indo-Tibetan Buddhism with the modern world. He is the author and translator of several books, including Düdjom Lingpa’s Visions of the Great Perfection (which provided the root text for this course), Stilling the Mind: Shamatha Teachings From Dudjom Linpa’s Vajra Essence, Tibetan Buddhism from the Ground Up, Natural Liberation: Padmasambhava’s Teachings on the Six Bardos, and The Attention Revolution.